Most of us don’t have conversations about parenting styles before we have kids, right? I know we didn’t. We just kind of experimented as we went along: trial and (lots of) error might be another way to describe it! Since we all come into parenting with absolutely NO IDEA WHAT WE’RE DOING, I think it’s safe to say that we all pretty much learn as we go! And when challenges come up, we probably all tend to default to parenting the same way that we were raised. 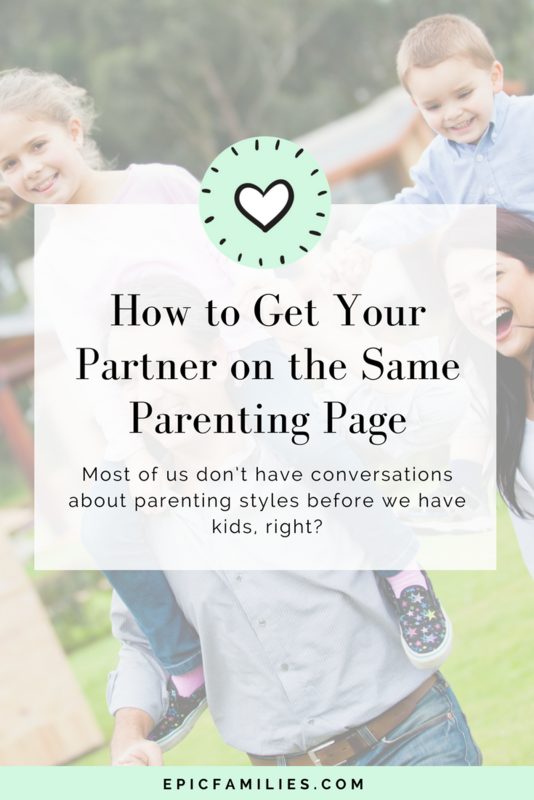 Issues revolving around bedtime, tantrums, time outs, potty time, back talk, homework, and the list goes on…..all have the potential to not only create headaches for us, but to create division between partners when each one’s parenting style differs. If both partners fall into the same category, great! You can start on the road to raising your little people together. If you’re both starting out from different places, you may have some issues to work through so you’re on the same page. Frequently what happens is that while both parents may start out in a similar place, one or the other realizes that their default mode is just not the best for their family. That parent makes a change and then conflict starts between the two partners. If you’ve followed me for a while, it should come as no surprise that I fall into the coaching/authoritative (not authoritarian) camp… but I didn’t start there. Like I said, we tend to default to the method with which we were raised, and yelling, spanking, and strictness were all what I was raised with. It’s not easy to shift a parenting style that we just take for granted. It’s what we grew up with; it’s what we’ve always known. As a couple, it’s important to come together and present a united front to our kids. Be adaptable not rigid. Just because you or your parents always did things one way doesn’t mean you can’t make a shift. Trust your instincts. My kids didn’t read the library full of parenting books I read, and I doubt yours have either. Don’t let experts, well meaning friends, or your mother-in-law make you feel bad for your choices.